Refurbished and re-engineered for sailmakers and other heavy tasks. Features the extra large flywhee l for increased torque and a new powerful motor fitted making this machine able to sew any material. Complete with a portable extension table. The table gives you extra long sewing space up to 42cm! The sewing machine is ready to use on any surface. NEW MOTOR AND FOOT CONTROL. + Lifetime Support & Servicing Guarantee! UPHOLSTERERS, LEATHER CRAFTS, BULKY MATERIALS & MUCH MORE.. Sew light, medium and heavy materials. CLOTHES/CURTAINS/DENIM (UP TO 12 Layers). Rear hand wheel for extra slow turning - Simple threading & easy to use - Steady paced motor for controlled sewing. Use all universal & feet needles. Exchanges can be made for similar products in the price range. Any product you return must be in the same condition you received it and in the original packaging. Sewing machine head, motor and foot control. Report your issue to us. 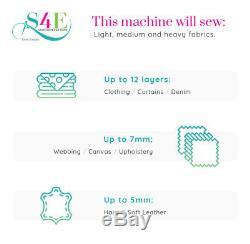 We can have the sewing machine collected using our courier service. Feel free to send any questions to us and. We will do our best to help you. 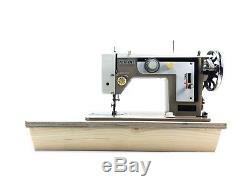 If your machine needs a repair or service then we can have your sewing machine collected using our courier service. You are required to keep all the original packaging. Here at Sewing4Everyone we pride ourselves in ensuring that when we refurbish and service each sewing machine, so you receive a thorough and excellent service. This means that we do not just give it a quick wipe and spray with lubricant. Each machine undergoes extensive maintenance to maximise performance and make sure that it is ultra reliable. Our expertise and experience means that each product benefits from. Changes to any defective parts or mechanisms. Electrical, power and safety tests. Testing against the density and thickness of a wide range of materials. 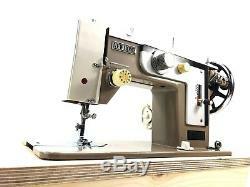 The end result is a fresh, perfectly stitching sewing machine. - - - - - - - - - - - - - - - - - - - - - - - - - - - - - - - - - - - - - - - - - - - - - - - - - - - - - - - - - - - - - - - - - - - - - - - - - - - - - - - - - - - - - - - - - - - - - - - - - - - - - - - - - - - - - - - - - - - - - - - - - - - - - -. New Motor & Foot Control. - - - - - - - - - - - - - - - - - - - - - - - - - - - - - - - - - - - - - - - - - - - - - - - - - - - - - - - - - - - - - - - - - - - - - - - - - - - - - - - - - - - - - - - - - - - - - - - - - - - - - - - - - - - - - - - - - - - - - - - - - - - - - - - - - - -. Large heavy flywheel for increased torque. This machine makes light work of any heavy materials. Fitted with a new powerful motor. Professionally serviced, timings set, tensions balanced, fully adjusted to enhance the performance for sailmakers and other heavy duty tasks. Set up and ready to use. STRAIGHT STITCH - ZIGZAG STITCH - REVERSE - STITCH LENGTH SELECTOR. 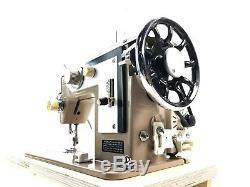 HIGH FOOT LIFT - LARGE FLYWHEEL - BOBBIN WINDER - DROP FEED (EMBROIDERY). VARIABLE SPEED FOOT CONTROL - NEW MOTOR - INSTRUCTIONS MANUAL - MULTI PURPOSE FOOT. PIPING / ZIPPER FOOT - BOBBINS - NEW PACKET OF NEEDLES - BASE. + Support & Servicing Guarantee! Rear hand wheel for extra slow turning and complete control Super easy maintenance Variable speed foot pedal for controlled sewing Robust and reliable with a solid metal frame Light to heavy work made easy with a presser foot control Professionally set up Get to work right away 10 bed space Simple threading Clip in bobbin case Use all universal needle sizes Uses domestic & industrial threads Universal feet. Say hello, we'd love to hear from you! Perfectly engineered sewing machine, ready for an array of taskmasters and challenges, here are just a few. Sew all general materials but also sew heavyweight materials. Sew through multiple layers of. DENIM (Up to 12 layers), OUTDOOR MATERIALS, SAIL CLOTH (10 layers), CURTAINS, WEBBING, CANVAS. UPHOLSTERY, CLOTHES, LEATHER (Up to 5mm) and many more.. 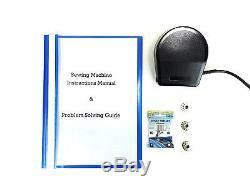 Crystal clear instructions easy to read manual included and super simple operation ideal even for sewing beginners. Robust, reliable, a real sewing workhorse Built to last a lifetime, this machine will serve you well and has, in-turn, been correctly serviced (covering every last detail). Feel free to send any questions to us and we will do our best to help you. What needles does the machine use? Universal needles, these are the same needles as the ones used on the domestic sewing machines today. Does the machine sew light weight materials? Yes, to sew lighter material just install a smaller needle, smaller thread size and loosen the tension by turning the tension knob counter-clockwise. For larger projects, how can you get more material under the machine arm? Roll the fabric up to fit under the machine arm. Use fabric clamps to hold the rolled material at the ends. What kind of thread can I use? All threads up to and including V69UV bonded & bonded nylon size 40. Are parts, attachments & feet easy to get hold of? Yes, these are widely available across the internet and sewing machine shops. The item "Sailmaker Zigzag Semi Industrial Heavy Duty Sewing Machine + Extension Table" is in sale since Saturday, January 5, 2019. 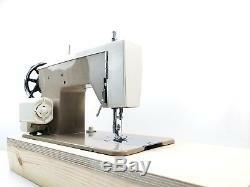 This item is in the category "Crafts\Sewing\Sewing Machines". The seller is "oosewing4everyoneoo" and is located in stoke-on-trent, Staffordshire.